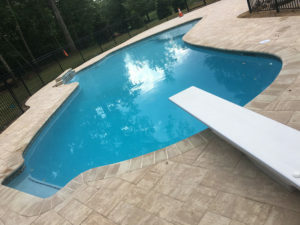 With more and more rain due to hit our area this season, it is important to realize what too much rain can do to your open-air pool in terms of damage. We can already feel it warming up outside, so it is safe to say that spring has finally sprung in the mid-Atlantic – what better way to get outside and enjoy your outdoor swimming pool? Although we can all agree to be thankful for the warmer weather, springtime also comes at a cost. With more and more rain due to hit our area this season, it is essential to realize what too much rain can do to your pool in terms of damage. Keep reading to find out how too much rain can put a damper on any outside gathering. If there are heavy storms, then there will likely be too much water in your outdoor pool. Make sure that if your pool is uncovered in the spring that you lower the water a bit to keep proper skimming action and to avoid contamination of the water from planters. You can also prevent your deck or patio area from flooding by doing this. You should either invest in a submersible pump or a pool cover pump to keep your pool from overflowing. If you do not have these, you can also siphon extra water from your pull with a hose. If your open-air pool floods, this can affect other aspects of your backyard landscape. If the water reaches your planters or garden, soil can pour into the pool. In more severe cases your pool could even fill with mud and debris. If this happens, use leaf rakes to remove large debris followed up with a slow vacuum to pick up the smaller bits. You can even add some clarifiers or flocculents that can be used to speed up the process. As you water clears, feel free to use a phosphate remover to consume phosphates in the water. Pour it into pool water, run the filter for 24 hours, then just backwash. Even though rainwater is clean, it can still cause you problems if your pool fills up with too much of it. As rain falls, it collects dust, pollen, pollutants, oils, and algae spores. That means that rain can end up adding phosphates and other organic materials to your pool water. To combat this, add some algaecide before an incoming storm. This entry was posted on Friday, April 5th, 2019 at 11:47 am. Both comments and pings are currently closed.